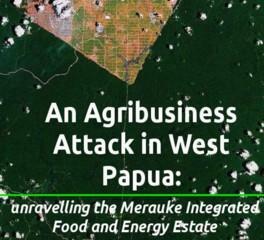 The Merauke Integrated Food and Energy Estate (MIFEE) is a vast mega-project, a plan for over a million hectares of plantations and industrialised agriculture that threatens the people and environment across the southern part of West Papua. Indonesian and foreign companies have each claimed their share of the land, and offer the local Malind people next-to-nothing in exchange for the forest that has sustained them for countless generations. West Papua, where the MIFEE project is set to take place, is a conflict zone. The Papuan people have been struggling for decades for their freedom and self-determination. West Papua is also the next frontier for Indonesia's plantations industry - after Sumatra and Borneo's forests have been decimated for the pulp and oil-palm industries, now Papua becomes the target. Although some plantations already exist, MIFEE represents another order of magnitude, opening the floodgates to development projects across Papua in which the losers will be the Papuan people. awasMIFEE! has been created as an act of solidarity with the social and ecological struggles of the people of Merauke and elsewhere in West Papua. We believe that it is important that people outside of West Papua also know what is happening in Merauke. However, information available about MIFEE can be confusing - much of it comes from different companies and government bodies, and each have their own way of describing the project that fits with their own interests and objectives. * Background information - to understand MIFEE in the context of West Papua, its history and struggles, and the local Malind people. *What is MIFEE - how MIFEE presents itself as the answer to Indonesia's food security needs. But is it actually just an excuse for oil palm and logging companies to conquer new territory? A look at the difference between the propaganda and the reality of development in Merauke. *Reports from villages: A summary of news of what has been happening on the ground around the MIFEE project area, compiled from reports of NGOs that have visited the area, local media and letters sent from villagers. *Company Profiles: Tracing where the money comes from behind each proposed plantation. Which of Indonesia's top business conglomerates are involved? How South Korean companies have been buying up plantations. How Australia's top-selling sugar brand is connected to forest destruction in Papua. News of further developments will be posted on the website, and from time to time updates containing news of all recent developments will be published.